Arsenal and Liverpool drew 2-2 at the Emirates, as Arsenal came back from two goals down. 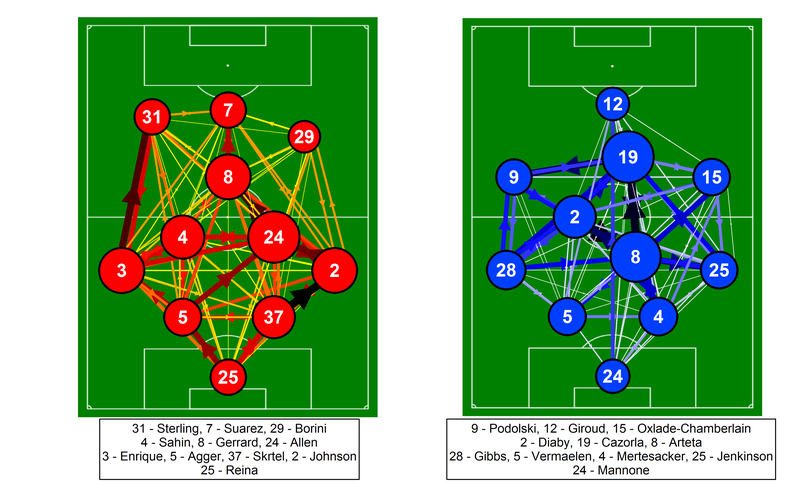 Below is the passing network analysis for Arsenal and Liverpool. More information on how these are put together is available here in my previous posts on this subject. The positions of the players are loosely based on the formations played by the two teams, although some creative license is employed for clarity. It is important to note that these are fixed positions, which will not always be representative of where a player passed/received the ball. The starting eleven is shown on the pitch, while Enrique and Santos, who came on as substitutes are shown on the sidelines. 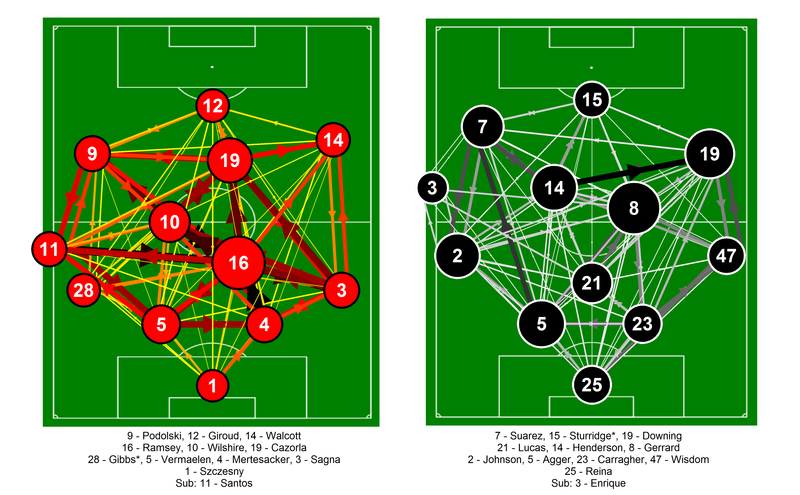 Passing network for Arsenal and Liverpool from the match at the Emirates on the 30th January 2013. Only completed passes are shown. Darker and thicker arrows indicate more passes between each player. The player markers are sized according to their passing influence, the larger the marker, the greater their influence. The size and colour of the markers is relative to the players on their own team i.e. they are on different scales for each side. The starting eleven is shown on the pitch, with the substitutes on the sidelines. Click on the image for a larger view. The contrast between the two teams approach is apparent, with Arsenal dominating possession (62% according to EPL-Index), which is reflected in their much stronger passing links across the team. Much of Arsenal’s play went through Aaron Ramsey, who played a similar role to that played by Mikel Arteta in the reverse fixture, although Arsenal saw more of the ball in this match. Arsenal’s midfield-three of Ramsey, Wilshire and Cazorla combined very well and dictated the passing patterns of the side excellently. For Liverpool, the story was slightly different. The side was happy to counter-attack, which meant that the usual recycling of possession in deeper areas was less prevalent than for example against Norwich. Most of Liverpool’s play went through Henderson and Gerrard (again Liverpool’s major passing influence), with Johnson and Downing providing good support down the left and right flanks respectively. Daniel Agger was also able to influence the game from deeper positions, with his passing influence score being third behind Gerrard and Downing. Suárez was reasonably involved, combining well with Agger, Johnson and Henderson. In terms of passing influence, Ramsey was the undoubted star of the show. He conducted Arsenal’s play from deep beautifully, completing over 100 passes in the process. Obviously this was partially a result of Liverpool’s approach, which allowed him the time and space to dictate play but he combined well with Arsenal’s attacking players throughout the match. Gerrard was the major influence for Liverpool, while Jordan Henderson provided a passing option higher up the pitch and brought Downing, Suárez and to a lesser extent, Sturridge into the game. This was an important function in the team’s counter-attacking. This entry was posted in English Premier League, Liverpool, Network Analysis, Passing and tagged Arsenal, EPL, Liverpool, Network analysis, Passing by Will Gurpinar-Morgan. Bookmark the permalink. You can view Aaron Ramsey’s isolated passing network here.